In the left panel of Exchange admin center, select compliance management. Near the top, select retention policies. Give the retention policy a name, add one or more tags, and select save. Note: If a suitable tag is not listed, create a new tag. 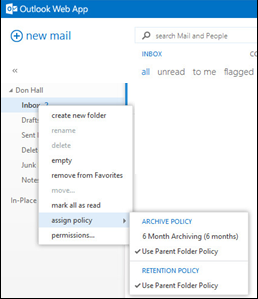 In this example, a retention policy named Executives retention policy was created, and 3 tags were included (1 week delete, 1 year delete, never delete). 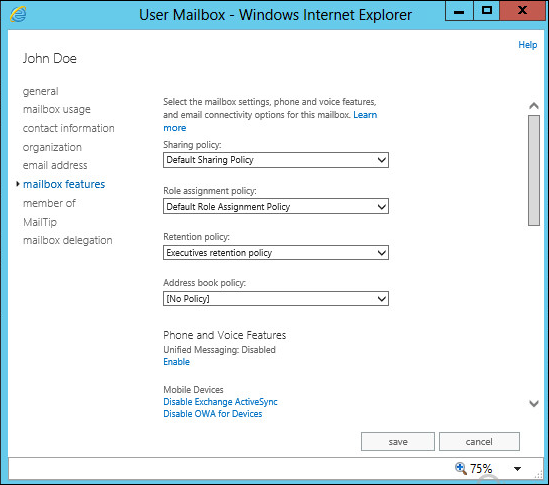 In Exchange admin center, double-click on a users mailbox. In the left panel, select mailbox features. In the Retention policy drop-down, select your preferred retention policy. In this example, John Doe has the Executives retention policy. Each user can select their preferred retention policy from the availble tags in their assigned retention policy. In this example, right-clicking on John Doe's mailbox displays the assign policy option.